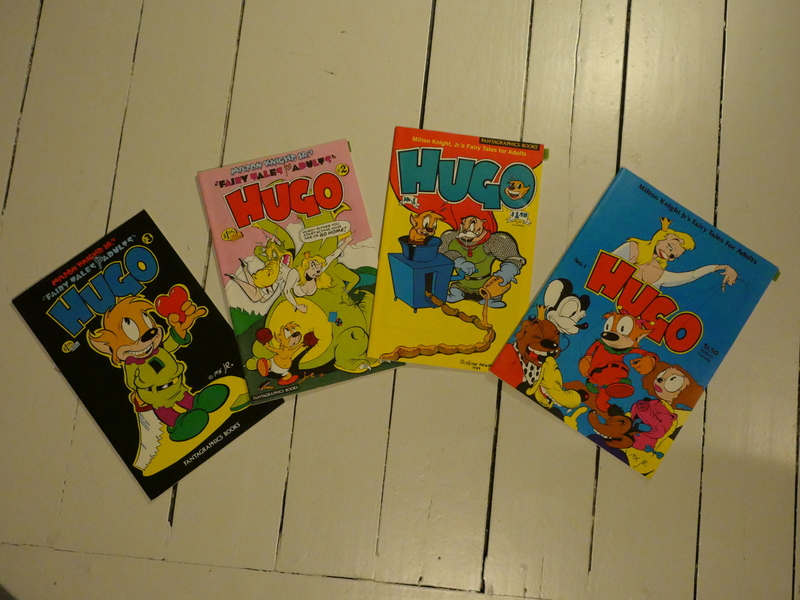 Hugo #1, Hugo (second series) #1-3 by Milton Knight, jr.
Hugo was, I think, Fantagraphics third comic book (after, ahem, Flames of Gyro and Love and Rockets). It’s been a while since I’ve read these comics. I can’t imagine I’ve looked at them since they were published, so that’s 30 years? The first issue is magazine sized, although it wasn’t originally drawn for that format (as evidenced by the banner on top of the pages). This was the one issue I didn’t have back then, and it’s distinctly more primitive than I remember the later issues being. 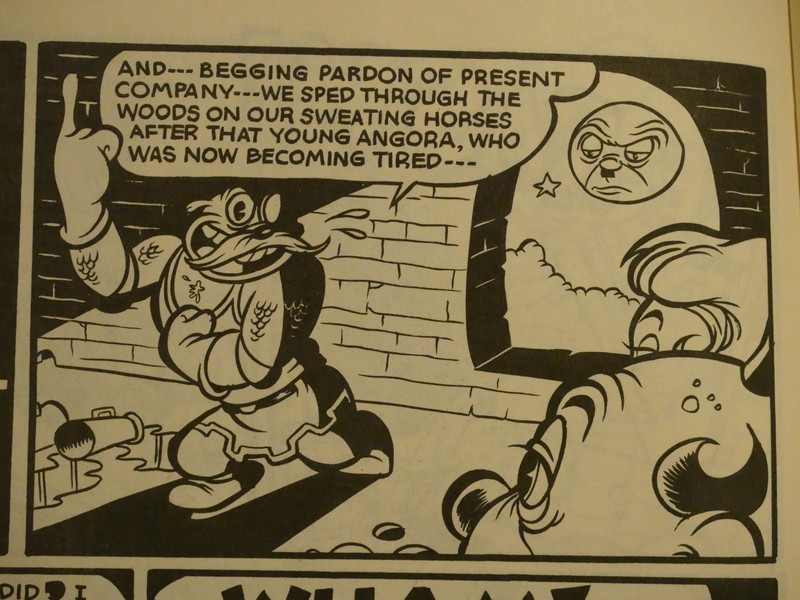 The readers aren’t left to puzzle out the influences themselves, but I think I also see a Floyd Gottfredson thing going on with those black-clad anarchists up there? 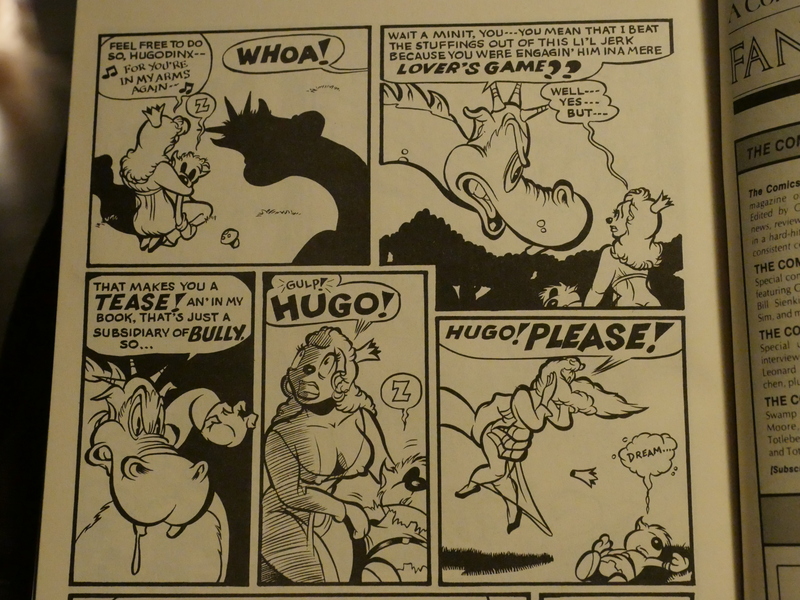 This is what I remembered Hugo being like: Male rights movement funnies. It’s probably a bit too subtle for Breitbart, though. 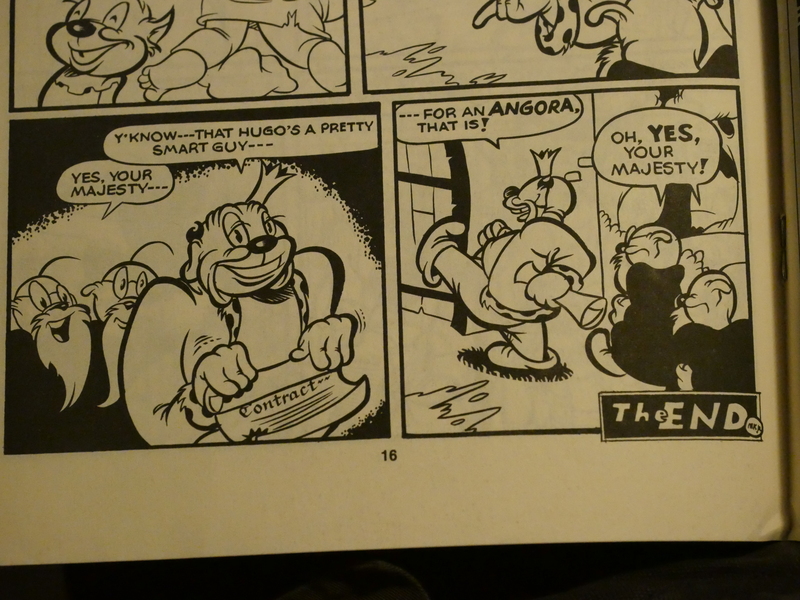 Trish, the Princess, tortures Hugo, the jester, who’s in love with her. But Hugo also plays these games, and Trish isn’t a cipher, so reading these comics I got a somewhat different vibe from what I remembered. Trish even saves Hugo from serious dangers. Knight has most of the characters talking in this dialect. 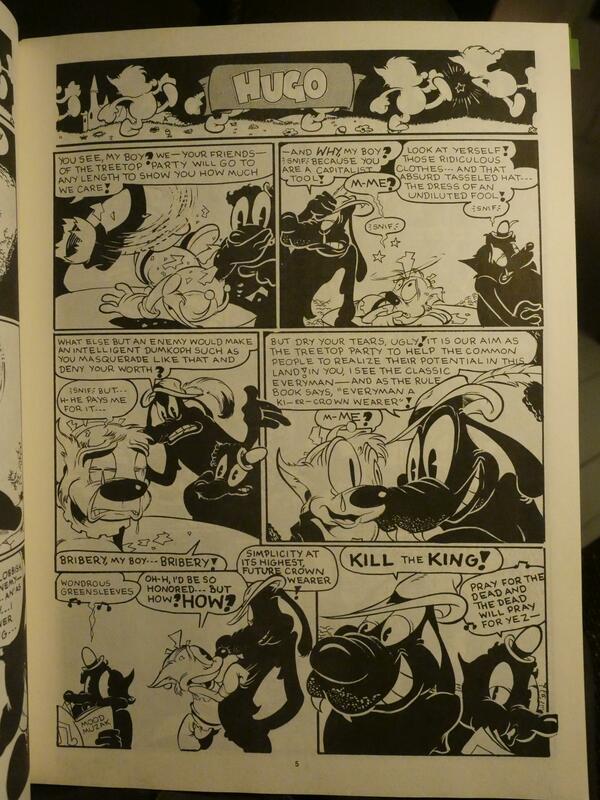 I don’t know… it doesn’t feel as natural as (say) George Herriman, but, on the other hand, that’s a pretty high bar to set, isn’t it? 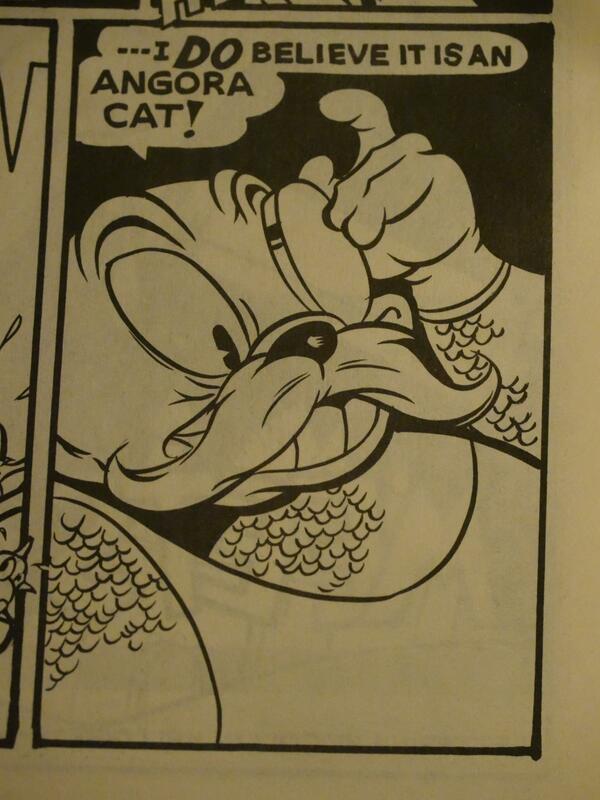 Knight is obviously pretty good at drawing in the Max & Moritz tradition. The characters are very lively, expressive and malleable, always dropping off into extreme expressions and postures. His thick-and-thin line is very appealing. … and then regales the court with tales of how he used to track down, kill and eat Angora cats in his youth. The metaphor is pretty obvious, but there’s a sheer visceral horror permeating this story that makes it really effective. And so the story ends with a ba-dump. Or ouch. The major story in the second issue (which is about Hugo finding self-expression as a comic book artist before being shut down by the marketplace, I meant the Church) is less effective. … until it turns horrifying. That’s not fun. So I guess I’d rate it “problematic”. What I remember Hugo best for was R. Fiore’s “best comics of the year” column in… er… one of those years, where he proclaimed that Hugo was better than Love and Rockets, which is probably something that’ll go down in Early 80s American Alternative Comics Aficionado History. (i.e., I remember it.) I had no idea what he was talking about at the time, because obviously Love & Rockets #1 was the best comic ever published (except for Love & Rockets 2, 3 and especially 4), while Hugo #1 was an amusing bagatelle. Perhaps it was a political thing. He’s written really confused stuff more recently. 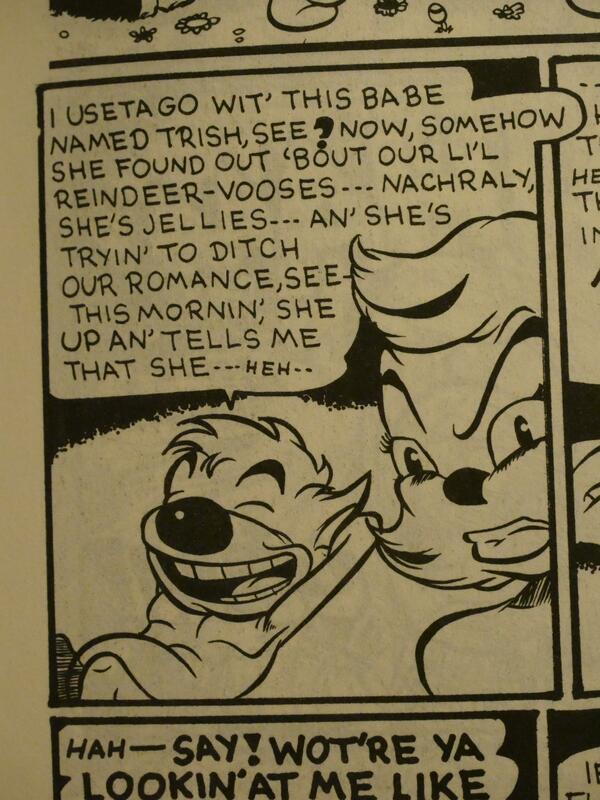 Perhaps the Hugo thing was just foreshadowing. 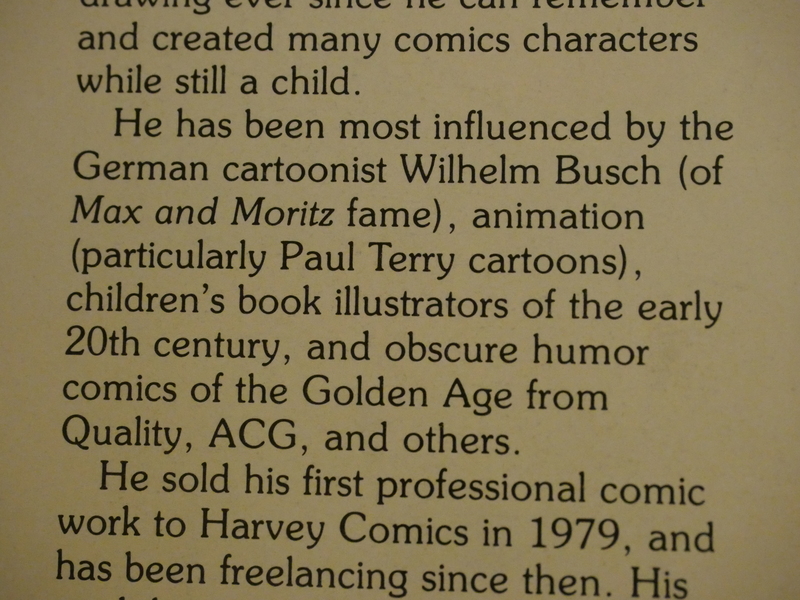 Milton Knight, jr. has occasionally published comics after Hugo stopped, but he’s mainly been working in animation. Previous Previous post: FF1986: Anything Goes!